June Bugs of the genus Phyllophaga are common sights bumbling around porch lights and screens on warm nights this time of year. June bugs. May-June beetles. Screen-thumpers. Whatever you call the large, lumbering beetles of the genus Phyllophaga that gather around Maine porch lights this time of year, rarely are they welcome visitors. That’s something that mystifies Clay Kirby, insect diagnostician with the University of Maine Cooperative Extension. There are several species of Phyllophaga found in Maine, which started emerging at the end of last month. The larvae of the June bug will spend two- to three-years below ground, allowing it to grow into one of the largest white grubs found in Maine . 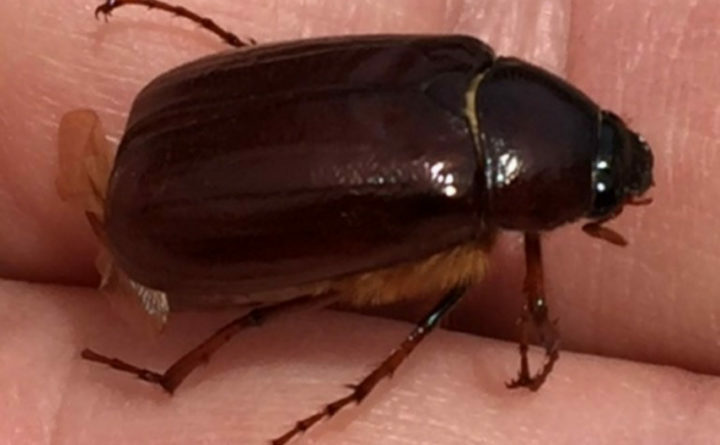 Since there are several different species of June bugs in Maine, Kirby said it can appear they live longer than they do. What people are seeing, he said, is different species emerging on different schedules. The last of the June bugs, he said are usually gone by mid-July. While above ground, a June bug is really interested in only two things — eating and making more June bugs. Native to Maine, June bugs are harmless to humans and don’t bite. But that’s cold comfort to people who face night time airborne gauntlets of the beetles swarming around porch lights or lighted screen doors. That fear reaction is fairly typical when it comes to insects, according to Dr. Lorien Lake-Corral, associate professor of sociology and coordinator of the social science program at University of Maine at Augusta. Entomophobia is the fear of bugs, but Lake-Corral said, for whatever reason, when it comes to insects there can be a “general confusion response” in the brain that displays as fear. In cultures where bugs are a human protein source, Lake-Corral said you don’t see that level of fear or disgust of insects like the June bugs. The fact that June bugs are good at startling humans does not help its reputation, either, Kirby said. Then there are those hairy, barbed legs. There are things that can be done to limit June bugs congregating around porch lights, like using a yellow bulb. To control them while still in the grub stage, Fish said there are certain species of nematodes that can be released which feed on the beetle larvae. Mammals like skunks, raccoons and birds including crows and seagulls feed on the larvae and if enough of the vertebrates come to dinner, it can tear up a lawn pretty quickly as they dig around for the grubs, he said. Kirby hopes people take a live and let live posture with the June bugs. “For me they are a lot of fun and I have pleasant memories of them,” he said, “Of course, I do remind my motorcycle friends to wear goggles or visors this time of year if they like to experience riding on these warm, summer nights [because] hitting a June bug at a high speed can give you a heck of a black eye.